Lasagna! So yummy and awesome with a glass of red wine. This book looks ((((AWESOME!!)))) My favorite Italian food would have to be Spinach Lasagna ~ with garlic bread, of course! We love and I mean love!! Pizza. We have it at least once a week. Sometimes with daiya, sometimes with shredded zucchini, sometimes just naked. Baked from scratch dough too! Yummy. Totally going to have to say almondfredo lasagna with thin slices of carrots and onions and mushrooms and lots of crispy breadcrumbs on the top. I love pizza! I make my own homemade whole-wheat crust and top it with mushrooms, sun-dried tomatoes, peppers, pineapple, and whatever else I have around! PIZZA! also a good, simple ciabatta bread is really the tops. Any kind of pasta is a favorite. I like maranara sauce with a splash of red wine. 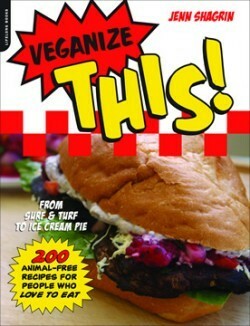 I HAVE TO HAVE THIS BOOK!!! Italian is a favorite of mine as it is SO easy to convert so much of it into vegan fare. I LOVE IT ALL! but I would have to say that a fresh roma tomatoes and basil sauce over whole wheat angel hair pasta is magnificent simplicity! I would have to go with tofu cacciatore or seitan marsala. But, who can go wrong with pizza, lasagna and eggplant parm? I grew up in a family of screamingly amazing Italian cooks so I've got mouth-watering memories of mile-high lasagna, bubbly-hot-cheesy pizza and my most favorite childhood treat, arancini...fried rice balls. My favorite these days is my Dad's homemade pesto pizza which he lovingly makes for me despite the fact that he is still bewildered by us vegans. I love me some Bruschetta. Homemade vegan lasagna is pretty amazing too. Angel hair pasta with homemade marinara sauce (and lots of garlic bread!) --yummy!